In honor of Women's History Month, several members of the LSU MOA staff provided some insight into their favorite pieces on display and/or in the permanent collection made by female artists. Stop by the museum to see these pieces in person, and share yours with us via social media by tagging your posts with #lsumoa. 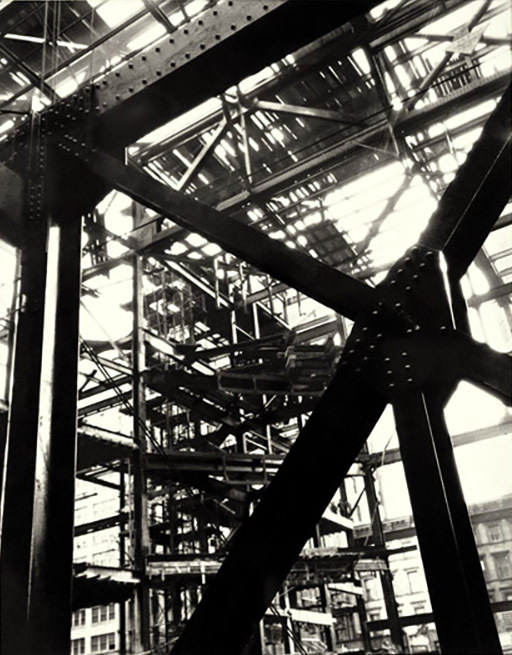 I really like Berenice Abbott's Untitled - Construction Skeleton photograph. I like the work because it has a nice abstract quality made with sharp focus photography. The composition appears to be more important than the subject in this case, which is interesting. Abbott is really good in finding beauty in ordinary places, which I think is what makes her great. On top of that, she was instrumental in publicizing the work of Eugene Atget, who is another great photographer that we probably wouldn't have known if it wasn't for her. This photograph by Berenice Abbott will be on display from April 7–July 9, 2017 as part of the Exploring Photography exhibition. Katrina Andry’s The Unfit Mommy and Her Spawn Will Wreck Your Comfortable Suburban Existence is one of my favorite pieces on exhibition right now because of its direct and confrontational nature. It projects stereotypes associated with African Americans onto white bodies, forcing the white-bodied figures to embody the role of “unfit” mother and a sort of black-faced or watermelon-faced “sambo” character. Andry is a recent grad of the LSU School of Art and an important emerging female voice working at the intersection of race and gender in Louisiana. Andry's piece is currently on display in the 20th century section of Art in Louisiana: Views into the Collection. Angela Gregory herself was one of the best sculptors of her time when the field was dominated by mostly men. She sculpted this mantel proof for Kate Gleason, who was the owner of Septmonts Castle at the time. Kate Gleason was the first female engineer to be a member of the American Society of Mechanical Engineers. This small painting by Clementine Hunter is my favorite for several reasons. As a nativity scene, Mary, dressed in blue with her baby bump visible is being directed by a white angel whose caring hands rest on her shoulder and back. Above the barn, two more angels—complete with 1960s bee hive hairdos—provide balance to the symmetrical composition that lies below. Hunter was known to paint the characters she perceived to have the most importance larger than others, so I delight in the fact the Mary and the angels are more prominent than the three wise men. To me, this is a beautiful celebration of the power of women, birth and the story of Mary. My favorite artwork is Sanctuary by Libby Johnson. The colors are so vibrant and the glass has a radiant glimmer and sparkle. It puts me in a happy place—where the candles are lit, the colors of my favorite time of the year, fall, shines through and my favorite color, purple, pops, and where a nice glass of wine quenches my thirst. If you look really close you can see all kinds of shapes and figures, and let your artistic mind explode. I chose Alberta Kinsey's Antique Shop. I love being a New Orleans native, so anything that reminds me of home immediately catches my interest. Because of the city's unique architecture, it's nearly impossible not to recognize neighborhoods like the French Quarter or iconic buildings like St. Louis Cathedral. While Kinsey's representation doesn't reflect the vibrancy most associated with the French Quarter, it does depict a moodier side that isn't often represented. I can't help but think her choice of muted tones speaks to a specific moment in history. For me, seeing Robin Levy’s Vessel is one of the most dramatic moments in the museum. 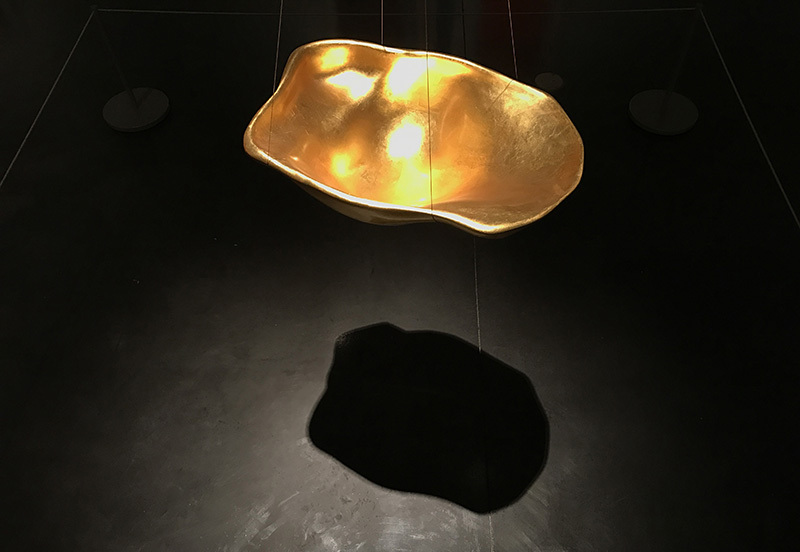 With luxurious gold leaf applied to the inside of the vessel, the object—a resin cast of the artist’s pregnant belly—reflects light so beautifully that it glows while appearing to be suspended in mid-air, drawing you in immediately as it transfixes your gaze. LSU Museum of Art holds an extensive collection of pottery, textiles, and watercolors from Newcomb College. In 2008, the museum purchased this elegant silver pitcher by Rosalie Roos Wiener. This Arts and Crafts style hand-hammered silver vessel is simple and unadorned. Newcomb College is well known for its art pottery, produced from the late 1800s to 1940. Less known, however, is Newcomb’s silver work, made during the same period. Old photographs of Newcomb College’s display rooms and exhibitions show examples of silver and other metalwork, including a pitcher very similar to this one. Actual surviving examples of silver objects, however, were, until recently, rare. Rosalie Roos Wiener was one of the most renowned Newcomb silver artists. She specialized in the design and fabrication of goblets with the elegant, simplified style of the Arts and Crafts movement and was awarded the title of master craftsman in 1930. Following the 2001 death of Weiner’s daughter, who lived as a recluse, numerous silver pieces were found in the family’s house in New Orleans. Many of these objects are the ones illustrated in the old Newcomb College photographs. This pitcher was unfinished; Weiner had made its components but had not assembled them. New Orleans master silversmith Ellis Joubert assembled the pitcher posthumously. The shoulder of the vessel is not original.